Ok, I’m not really a fan of saying “I went to church” or “I am going to church” since the church is a people and not a building or worship event. 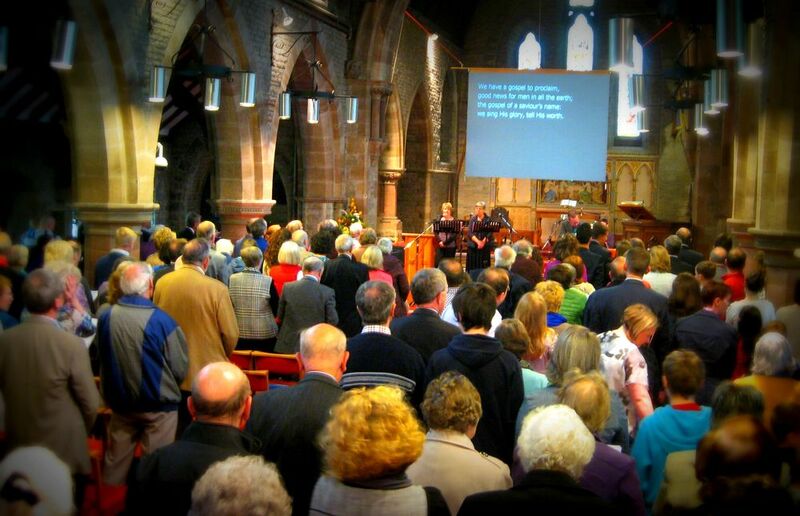 Nevertheless, that’s how our society speaks of gather for worship with a Christian church. Most church communities have some sort of centralized gathering where people come together for worship and fellowship that includes singing, praying, reading scripture, preaching, and participation in the Lord’s Supper. Maybe these churches do a few other things together like Bible-class time or a meal but regardless, this is a very typical feature of church. Yet in recent years it seems like this tradition, especially of the contemporary style, has taken its share of criticism from both Christians and non-Christians (see, for example here and here). But yesterday, I went to church with my family and enjoyed it. So did my family. I am a minister of the gospel… a preacher or pastor, as some call me. I really don’t put a lot of stock in titles, as I am just trying to follow Jesus whom I believe is Lord. For the last three and a half years I served with the Columbia Church of Christ until the church decided it was time to close at the end of January 2015. I still believe I am called to serve as a minister of the gospel and so I am searching, waiting, and listening for the church God wants me to serve with next. But in the meantime, what do I do? The first two Sunday’s in February I was doing some guest-preaching in a couple of different churches in the area. Then there were two different snow storms each of the next two weekends resulting in every area church canceling their services because of the weather and road conditions. So each of those two Sunday’s were spent at home with the family (no complaints). Although I have daily disciplines such as regular prayer time and daily Bible reading to help maintain my own faith and don’t expect the worship gathering to sustain my faith, it felt odd to sit at home on Sunday and not be at church. Then came yesterday. I wasn’t expected to be preaching anywhere or doing anything else as a minister and I certainly didn’t have to get out of bed, should I have chosen to sleep in which I’ll admit was a tempting idea. So came the moment that I had to answer for: Do I go to church only because I’m the preacher or do I go because, for all of the criticisms I might raise, I really believe in and value gathering with other believers for worship and fellowship? So as I have said, I went to church. I went with my wife and children. We visited the Countryside Fellowship Church in Savage, Maryland where a few of the people from the Columbia Church of Christ are now visiting. I also happen to know the pastor of that church, so there was that connection too. The atmosphere was relaxed, somewhat contemporary but it didn’t seem like the church was trying to keep up with the latest trendy fads in worship. The members were friendly and hospitable without pushing themselves upon us. The worship began with a reading from the Psalms and a call to worship. After singing several songs, the pastor preached on Revelation 3:1-6 (Jesus’ message to the Church of Sardis) and then we shared in the Lord’s Supper together before singing one final song. In so many ways the gathering was typical and normal with nothing spectacular except for the presence of the true living God. It was just church. Yet it was nice, for a change, to sing, pray, read scripture, encounter the preached word of God, and share in the Lord’s Supper not as the preacher but just as a worshiper. It was nice to be reminded through song, prayer, scripture, word, and the Lord’s Supper that even though I am not righteous on my own accord, I belong to God and live in the glorious presence of God because of the blood of Jesus Christ by which I am made righteous. That message was especially pointed as we sang the song by Kutless Take Me In (To The Holy of Holies). 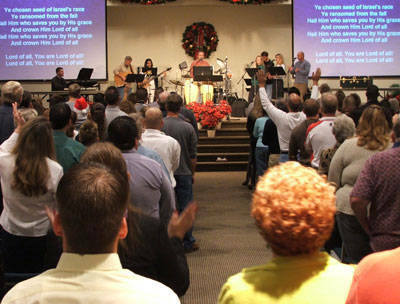 I know that there are churches where worship is a lifeless endeavor of just going through the motions of a dead faith. Likewise, I know that there are other churches where worship has become such a professionally manufactured endeavor that the work of the Spirit seems stifled by a shallow faith. But as I reflect on going to church, I am reminded that when we come ready to give our heart to God we receive… not some superficial emotion that is meant as a mask to whatever junk we are dealing with. I’m still struggling with the worry of my family and I living in limbo as we await the next church I’ll serve with. What I received was joy, the kind that Paul spoke of in Philippians 1 where he was content with whatever happens because of his solidarity with Christ. I received this gift of joy not because I deserve it or could obtain it as though it is a commodity. I received it simply because I showed up at church desiring to worship the God who, by his grace and mercy, has made me alive in Christ and given me his Spirit as the assurance of this life. So yeah, yesterday I went to church and I am glad I did. I’ve started preaching a short series through the Old Testament book of Jonah. The popular understanding is that this book is a story about a man and a giant fish. It’s not! The fish is only mentioned in a total of three verses (1:17; 2:1, 10) and while the story a man named Jonah, the book of Jonah is about God. That’s right. The book of Jonah is about God, the God whom Jonah claims to worship. As Jonah flees God, sets sail with a bunch of Gentile shipmen bound for Tarshish, and the violent storm erupts on the sea, Jonah proclaims his worship of God, saying, “I am a Hebrew and I worship the Lord, the God of heaven, who made the sea and the dry land” (1:9). Jonah’s declaration was the typical way a Jewish person would speak of God among Gentiles but considering the context, it’s a laughable claim. The word “worship” (yârê) literally means to fear. It has to do with the sort of reverence that results in obedience to God. In the broader sense, such reverence may include ceremonial acts of worship but it will always includes moral and ethical obedience. In the book of Jonah, the prophet’s claim of worshiping the Lord means he should mean obeying God’s command to go and preach against the city of Nineveh. But Jonah doesn’t! And that is the beginning of the irony in his claim to worship God. While Jonah claims to worship God but instead flees God in disobedience, the Gentile sailors encounter God though the testimony of Jonah and the violent storm. Though they attempt first to call upon their own gods and then turn to their own ingenuity in trying to survive the storm, they eventually learn to fear the Lord. After throwing Jonah overboard, we are told that “the men greatly feared the Lord, and they offered a sacrifice to the Lord and made vows to him” (1:16). This is to say that these pagan sailors learn to worship God through ceremony and the making of promises regarding how they will act in the future. Jonah is a Hebrew, one who knows God and claims to worship God but proves through his disobedience that such worship is a feeble notion. The sailors, on the other hand, are pagans who learn to worship God. This is not to say that they have become monotheists who ascribe to every orthodox dogma regarding God. What it means is that the sailors have acknowledged God as the Lord, who must be obeyed. The irony is that the one who knows God and claims to worship him, fails to do so while the ones who did not know God, came to know him and render worship to him! So who do Christians worship? I know that sounds oxymoronic but I’m guessing that if Jonah, who knows God, can fail to worship God then Christians, who claim to worship God can also fail to worship God. Worship as obedience involves living as Jesus teaches us. Jesus shows us what it looks like to love God and neighbor. This isn’t about turning Christianity into a new set of legalisms regarding church life and worship, it’s about living a life of humble service, dying to self while following Jesus to the cross as people who point to Jesus in the very way we speak, think, and act. How we speak, think, and act towards our neighbor is how we speak, think, and act towards God. . . and our neighbor is everyone, including those we regard as an enemy, foreigner, freak, stranger, and so on. Similarly, such obedience demands consistency between what Christians sing and pray about “in church” and how they live in their homes, neighborhoods, work places, and even in the world of social media (i.e., Facebook). So if you’re a Christian like I am, then the question is: Will we walk in obedience, following in the footsteps of Jesus? Will we worship God today?